Remember those ads with He Man and Skeletor? Or the ultra disturbing Strutters and the Builders? 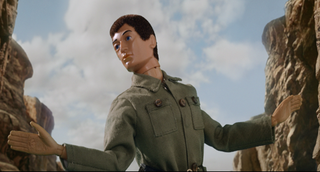 The folk at insurance comparison firm Money Supermarket have a new dancing hero to pedal their wares, Action Man! The plastic soldier with the real hair, gripping hands and eagle-eyes feels epic because he has saved some dosh and this demands a desert dance off. Goes to show Joe, you ain’t got the moves.